Star Wars might not have a big panel at San Diego Comic-Con this year, but that doesn’t stop the new toys—arguably just as important as the films at this point!—from making the news. Hasbro just unveiled a bunch of new figures, all the way from the original movies and prequels, to Rebels, and a tiny glimpse of what’s coming with Rogue One. The first reveals came for the Black Series line of six-inch figures, a veritable bevy of new toys from all over the franchise—including a realistically-styled version of Hera from Star Wars Rebels, Qui-Gon Jinn, a Tusken Raider, an Imperial Guard, the non-SDCC-exclusive version of Obi-Wan Kenobi, and everyone’s favorite Cloud City governor, Lando Calrissian. Not even the now defunct Expanded Universe could escape toyification, with the announcement that Jaina Solo had won this year’s “Fan Choice” voting competition, and would be made into an action figure. 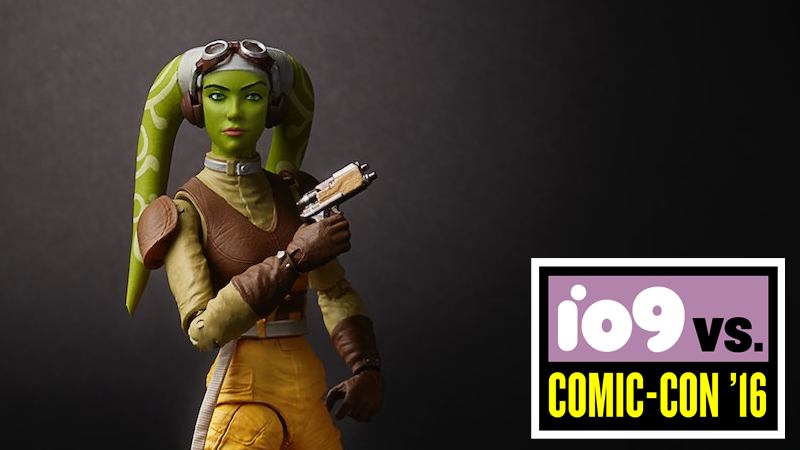 In the smaller 3.75-inch line, Star Wars Rebels got most of the love, with three new figures from the third season of the show unveiled: Mandalorian Fenn Rau, who will re-appear after a brief appearance in season one, a new version of Hera with her own A-Wing to pilot, and of course, incoming fan favorite Grand Admiral Thrawn. Also revealed were even more toys for The Force Awakens—although not much, just a new version of Poe Dameron in his Resistance dress uniform, bundled in a two-pack with a First Order Snowtrooper. Rogue One, sadly, was barely part of the panel, despite the fact that we’re supposedly a mere handful of months from a second “Force Friday” that will herald in the toys for the first Star Wars spinoff. It did have one new reveal, though—one that there’s no official pictures of yet, but was shown at the panel for attendees to photograph. The AT-ACT, the new kind of Imperial Walker seen in the trailers for the film, is being developed as a new playset for the 3.75-inch Rogue One figures. It’ll come with three of them—Jyn Erso, a Shoretrooper, and an Imperial Astromech—and, rather awesomely, it is capable of moving around, lighting up, and playing sounds, all remote-controlled through a smartphone app.